Fabric: Melodies pg 1 - Melodies was designed by Jo Morton for Andover Fabric. Melodies was designed by Jo Morton for Andover Fabric. 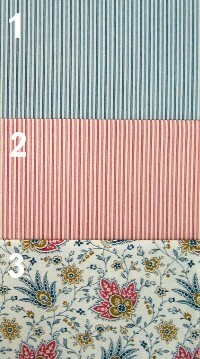 The fabrics shown have blue stripes, red stripes, and flowers.